Bhubaneswar: Kerala tourism on Tuesday organized a roadshow in Bhubaneswar to attract at least 10 per cent domestic tourists from Odisha this year. While the tourist footfall was around 7-8 per cent last year, Kerala tourism eyes to increase it up to 10 per cent this year, said an official of Kerala Tourism department. Breaking its longstanding identity as a slow-paced destination, Kerala Tourism repackaged its places of attraction in a bid to tap the domestic potential. After the roadshow at Bhubaneswar, it has planned similar events in Andhra Pradesh, Gujarat, Uttar Pradesh, Maharashtra and Madhya Pradesh. 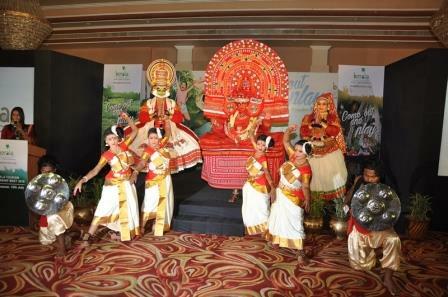 The roadshow showcased the presentation of a short 30-minute cultural program, a visual storytelling that showcased the various art forms of Kerala. Tagged ‘ComeOutandPlay’, the campaign is aimed at domestic travellers who have been seeing Kerala as an antidote to urban experiences and as the antithesis of routine. The new campaign sheds light on activity-based tourism and invites India to come out of the isolation that gadgets induce and to connect with each other and nature. From high mountains and deep-cut valleys to sunny tropical beaches and placid backwaters, Kerala’s 38, 863 sq. km holds within itself a variety of landscapes that differ in settings and flavour; each one of them offering an opportunity to relish the outdoors. Several eco-friendly sustainable initiatives would constitute the high spot of this year’s domestic campaign. The revamped fare with an array of new tourism products was showcased at Bhubaneswar on 10th July 2018. “Be it the Kerala Boat Race League or the Jatayu Earth Centre, all the products are environment-friendly and promote responsible tourism,” said Kadakampally Surendran, Kerala Tourism Minister. 2017 was a landmark year for Kerala Tourism, in terms of domestic footfalls, which increased to 14,67,3520, translating into an 11.39% Year on year growth. Apart from repeatedly being lauded by magazines like Conde Nast Traveller (Best Leisure Destination), NatGeotraveller, and winning 6 National Tourism Awards last year, Kerala was recently chosen by Lonely Planet Magazine India as the Best Destination for Families (India) 2018. To reach out to the domestic market, a string of partnership meets are being organized in Bhubaneswar, Vijayawada, Ahmedabad, Vadodara, Surat, Lucknow, Indore, Nagpur, Pune, and Mumbai in the next few months. A combination of a cultural feast of Kerala’s traditional art forms and its attractive tourism products, these Partnership Meets provide opportunities for the tourism Trade in the respective cities to interact with over 40 tourism industry players from Kerala.